We have a cornucopia of delightfully tasty treats on your Thanksgiving menu this year to satisfy even the most discriminatory arch rivalries taste buds. Our unhealthy main entrée of hate and discontent has been simmering in a sauce of disappointment, with a hint of aggravation for an entire year, and it is just about ready to be served. You should really enjoy this meal that has been painstakingly prepared…. We have Apple Cups and Palmetto Bowls, along with a tasty, yet not overpowering Sunshine and Sunflower Showdown served, for those who enjoy a rustic Thanksgiving, in an Old Oaken Bucket. There will be cups served by governors from commonwealths cut with Paul Bunyan’s Ax deliciously prepared in a nice bayou classic while being stirred ever so gently with a jeweled shillelagh. For those with heartier appetites who desire something considerably spicier we have prepared a limited portion of Golden Egg Bowl topped with Good Old Fashioned Hate and an unhealthy side of Civil Damn War served in an Iron Bowl. But let me warn you, the bitterness of these dishes may last you all year. That leaves The CFB Wizard at 527 and 141 or 79% so far in the season…. I know, you don’t need to say it…. Up in Athens, Coach Mark Richt’s Pups had a tune up game for the intra-state scrap between the hedges this week. These Mangy Mutts sank the Buccaneers of the Holy City to the tune of 55 – 9 in a game that was over before the student body had finished arriving. The Cow College ground out over 560 yards of offense with Hutson Mason going 10 of 12 for 187 and 3 passing TD’s and Nick Chubb going over the century mark for the sixth straight game. Over in Atlanta, Coach Paul Johnson was obviously conducting some after school tutoring as he is no doubt trying to figure out a way to defang the Dawgs for Saturday’s next edition of Clean, Old Fashioned Hate. With Duke’s demise against North Carolina on Thursday, the Bees have been crowned Coastal Champions and hope to scalp the ‘Noles for the Conference Championship on December 6th. And the Birds of the ‘Boro also took a week off to regroup after getting soundly trounced by the Middies of Annapolis. Coach Willie Fritz’s flock will no doubt be a bunch of Angry Birds come Saturday as they take on the Warhawks of UL-Monroe in an effort to seal the deal and lock up the Sun Belt Conference in their inaugural season. Tennessee – Came up short. UGA needed that win to take the East Arkansas – Two SEC wins in a row. And in convincing fashion. Can you help us out and get that 3rd SEC win? Florida – Got one more “W” in ya? Can you send Will out on a positive note? Kentucky – Well…. At least basketball season has started. 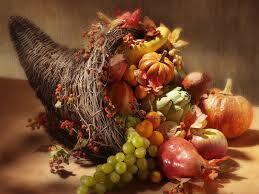 Thanksgiving – I love this time of year. It’s the time when great food is served and great games are played. But most of all, it’s a great time for family gatherings. This year, our gathering will be without one of my kids who has relocated to another part of the country. There will be a gathering of the family, but it won’t be the same without him. We always like to think of military and first responders who can’t make it home for the festivities. It’s a kind of lonely feeling if you’re away. So, let’s also think of those dear family members who, for whatever reason, just can’t quite make it back to share in the festivities and fellowship of this holiday. I got me an idea and I am a wanting you to promote it! My wife (Gracie) and me done got us an idea, you ready? We got family recipes for roasted possum, possum and sweet potatoes, grilled possum, pickled possum feet (my favorite), possum stir fry, possum jam and a bunch others! What do you think, will you help us? A: I’m sorry I was distracted….. I just did a trick and you didn’t even see it! Any WHO…..So here is my question, are you ready? Shazam! Do you think there is any correlation to animal mascots vice other non-descript mascots for the selection committee on who does or doesn’t go to the four team playoffs? While I am waiting for your answer….I just did another Trick! Shazam! A: Jack, I can appreciate the fact you are writing from your grandmother’s basement while wearing your Garanimals pajamas, but it’s best that you leave critical thinking to the grown-ups and continue to take your prescribed medications. Q: Mister Wizard will you be shopping this year on “Black Friday”? What gift ideas are you looking to get a deal on this year? Q: You are the dumbest @#$ of a *&$%^ alive! All you are doing is stirring a pot of #$%^ without a spoon. 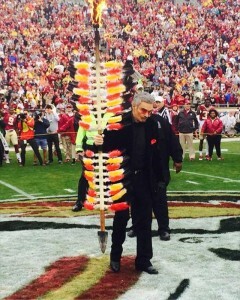 There is NOTHING going ON at Florida State that hasn’t been investigated! Well who do you think trained that Coach? The same guy with a giant statue on the Florida State campus, that’s who! Why isn’t anybody talking about how great he still is, I ask you! If it wasn’t for that great Coach then there wouldn’t be a Coach Fisher and last years Championship! A: Don’t be alarmed, Coach Bobby still gets confused sometimes…. ESPN COLLEGE FOOTBALL GAMEDAY: Having College Game Day for the Harvard – Yale game was sooooo cute….. When I heard the team’s coaches and the players say…..
VIRGINIA TECH: All you could muster was three lousy points against Wake Forest? NORTH ALABAMA: My beloved Florence Lions went down last week in a hard fought game against Valdosta State…. It’s time to break out the Delta State apparel…. Coach Stoops where in the hell have you been hiding that kid that ran for 427 yards last week against Kansas? You can laugh if you want too…. TENNESSEE: Last Week Coach Butch Jones of Tennessee took to the television stations and the air waves to encourage the Volunteer faithful to sell the game out against Missouri. He pleaded with the fan base to show up to Neyland Stadium for Saturday night…. What the Hell is wrong with you people that you can’t sell out a home game with Bowl implications? OLE MISS: I guess it’s safe to say…..
MINNESOTA: Coach Jerry Kill’s Gophers are playing the most inspired football of anybody (and I do mean anybody) in the Big Ten Conference. 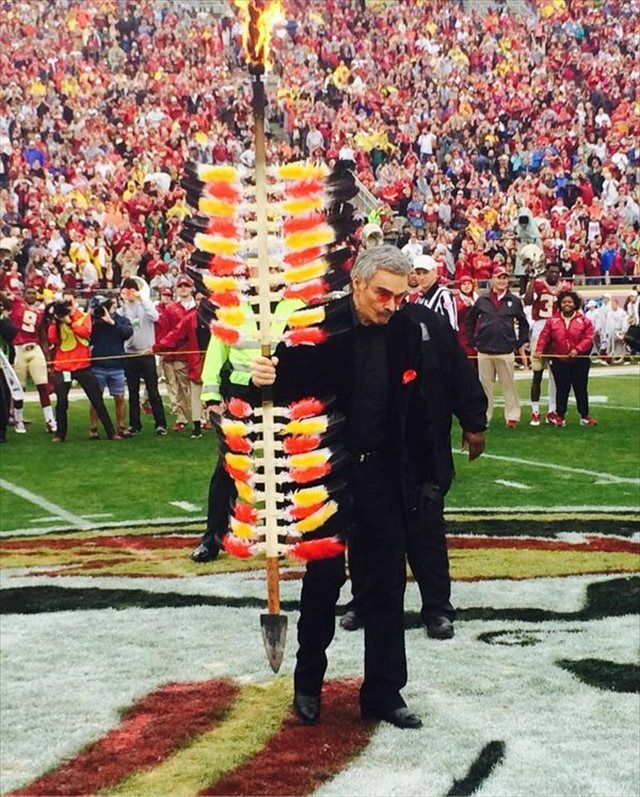 FLORIDA STATE: In case you missed it…..
Last Saturday Florida State had the great Burt Reynolds plant the spear at mid-field to start the game against Boston College. It hurt my soul to see how old and frail Burt has gotten…. 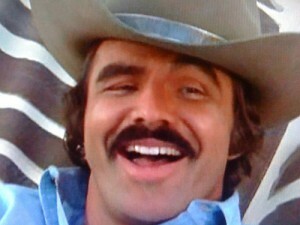 This is how I prefer to remember Burt Reynolds…. COLLEGE FOOTBALL PLAYOFF: With all the rhetoric and debate about “Who” should be in the four team college football playoff. I want to simply say this…..
Those three teams may very well be playing the best football of anybody in the country at the moment. Believe it…. “IF” this past Sunday in church, you had people on one side of the church representing one university and the other side of the church representing the opposition, then you have yourself a rivalry. “IF” you don’t let your kids play with the neighbors kids the week before the rivalry game only because they represent your archrival, then you have yourself a rivalry. “IF” you see a vehicle passing you and it has a license tag, or bumper stickers etc. representing your archrival and your middle finger does not instinctively come up on its own, then you DO NOT have yourself a rivalry. “IF” you avoid the phone, family, friends and neighbors several days after your beloved team lost to your archrival then you have yourself a rivalry. These two fine Universities don’t have a name for their rivalry and there isn’t any trophy. Primarily because it’s difficult to accurately reflect “hatred” on a trophy. Sometimes Thanksgiving Dreams do come true…. I twisted my ankle jumping off the Aggie bandwagon two weeks ago…. Why somebody is playing for a sandwich is beyond me….. They call this Battle in the Sunshine State…. If when they announce “The War on I-4” before the game…. The Midshipmen of Navy are steaming towards their matchup with Army…. So let me be the first to say…. GO NAVY – BEAT ARMY! As much as I hate to admit it…. This instate Battle in the Land of Sand and Illegal Aliens…. Stick a fork in the Turkeys of Tech…they are done for the season. It’s played for the Platypus Trophy…. It’s going to be a bloody one and believe it or not….. This “not-so” bitter instate rivalry in the Sunflower State is called…. And in case you were wondering….. This Battle in the Commonwealth of the Bluegrass is played for…. Although the Hurricanes have been downgraded to a tropical depression…. Not that it matters here…. Thanksgiving in Morgantown is known for two wonderful traditions…. 1: A wonderfully prepared meal with family and friends enjoying the warmth of kith and kin in an embrace of thanksgiving and gratitude for all of life’s blessings. What is the origin of the “Old Oaken Bucket” trophy? They decided many years ago on an Old Oaken Bucket trophy….. This game is what we like to call “filler”…. As you may have already guessed…. This leads me to the question…. “What’s “Beyond” mean…beyond what…Outer Space? This rivalry doesn’t have a name or a trophy…. It should be a balmy zero degrees in Big Sky Country by kickoff….. This border war doesn’t have a name or a trophy…..
Kind of warms the heart, doesn’t it? There will be fights, arguments, and brawls and name calling….. I would love to see the Red Raiders ride….. Both schools should save their money and play this game via correspondence…. This instate rivalry wasn’t much of a rivalry until the Commodores started winning the past few years, but now it’s serious for the folks in Orange. I have a lot of respect for both teams in this contest…. Keith Jackson, The voice of College Football, had this say about this game.. Your Week 15 Picks will be out next Thursday, providing of course I am not having a liver transplant from the results of the Iron Bowl. There should also be a little something on mikerights.com next week to get you in the mood for December. The past year and a half has been the hardest I have ever experienced in my adult life and I certainly wouldn’t wish the pain, disappointment and rejection I have endured on anyone. God has used these trials and tribulations of mine to sand down my rough edges, make me a better person and to prepare me for the future. Whatever that might be….